Lynne Barber is a name many in the community recognize because of her caring heart and open hands in the field of giving and helping others. Barber has worked extensively over the last decade with local domestic violence prevention centers and now with New Beginnings Pregnancy Center in Ash Flat. Recently, Barber was honored nationally with a very prestigious award — The Sunshine Peace Award. 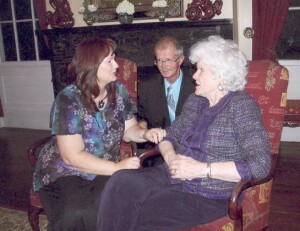 She and her husband, Thom, traveled to Wilmington, N.C. in August to accept the honor. Lynne Barber visits with Dorris Buffett, sister of Warren Buffett, at The Sunshine Peace Awards in Wilmington, N.C., as her husband, Thom, looks on. Barber received the $5,000 award along with a crystal peace dove and autographed book. Barber was one of only 15 women in the United States to win the award this year and the first from Arkansas. As part of her award she also got to choose a worthy cause to receive an additional $5,000. Barber chose Safe Passage Shelter in Izard County and later presented the check to Director, Lorri Rorie. Barber was one of only 15 women chosen annually to receive the award for her work and support in bettering the community in which she lives. She was also the first recipient of the award from the state of Arkansas. The Sunshine Lady Foundation, the organization responsible for establishing and awarding the peace awards, is a private family foundation established in 1996, through the vision and determination of founder and President Doris Buffett, sister of Warren Buffett. Buffett, like Barber has worked tirelessly as an advocate, fundraiser, board member and community organizer on behalf of battered women and their children. The foundation’s primary focus is to continue to develop and enhance efforts in an attempt to end the vicious cycle of domestic violence. Funding priorities of the Sunshine Lady Foundation include education, scholarships and helping families in crisis. As part of the award, Barber was awarded $5,000 and a crystal peace dove symbolizing domestic peace as well as Buffett’s autographed book, “Giving it All Away.” Through Barber’s award, she was authorized to select a worthy charity to also receive $5,000. Barber selected Safe Passage Shelter in Izard County. Director Lorri Rorie was very proud of the donation to further the cause of domestic violence prevention. A portion of Barber’s winnings also went to CASA Third Judicial District, New Beginnings Pregnancy Center and some other local ministries. Barber said she absolutely loved Dorris because they had a lot in common. “We both believe in paying it forward,” Barber said. She said she is so humbled to receive the award, one that emphasizes the importance of volunteering and doing the best one can for others. She said her husband Thom is her driver and she has been blessed with him and he is a very important reason for her being nominated for the award. Barber said she just wants to be a blessing to others. The award recognizes extraordinary individuals who make a difference in their communities in the field of helping prevent domestic violence. Candidates are nominated and judged on excellence in administration of programs and in victims advocacy. Barber was nominated for the award by former co-worker Martha Jones who worked with Barber at Spring River Adult and Child Services (SACS). Barber first began volunteering at a battered women’s shelter in Batesville and has held various positions of service to the community since 2001. She has served as director of Struggle Buddies Christian Ministry, executive director of Family Violence Prevention and other positions with adult and child services in Sharp County. Some of her proudest accomplishments are her partnerships with community programs. The partnerships have allowed her to facilitate three educational programs, a district court advocacy program in which peer counseling and education are provided to victims of domestic violence during criminal court. Barber participates in weekly family violence prevention for inmates at the Sharp County Jail. She also participates in Adventures in Granparenting, a weekly support group for grandparents who are raising grandchildren. She and her husband Thom also provide help and support to survivors of domestic violence and any other place they see a need in their community. The Barbers live in Cave City. As Margaret Meade passionately summed up the act of volunteerism, “Never doubt that a small group of thoughtful committed people can change the world indeed. It is the only thing that ever has.” This is one of the things that drives both Buffett and Barber to make a difference in the lives of others. Barber and her husband are also actively involved in Safe Passage Pregnancy Center in Ash Flat.